Remove the bottom cover of the RoWrite Pen by twisting counter-clockwise. Take the AAAA battery supplied in the packaging and place it inside the pen with the “+” facing away from you and going into the Pen first. Please make sure to re-tighten the cap all the way. In the package you will find one (1) D1 or mini ballpoint ink cartridge. When you need to replace your ink cartridge take the Ink Cartridge Extractor, also supplied in your packaging, and pinch the tip of the cartridge and pull out. Take the new cartridge and push it back into the Pen. Royole offers 3-pack Ink cartridges for purchase, but any D1 or mini ballpoint Ink cartridge will work. Go to www.royole.com to see all the RoWrite accessories available. Press the left button to turn on the RoWrite. Once on, the blue light will flicker at low frequency and RoWrite is ready to use. To turn off, press and hold the button for2 seconds. When the battery is low, a red led lightwill flicker. Please plug in your RoWrite to charge. When RoWrite is charging the red led light will stop flickering, once fully charged the red led will turn green. A fully charged RoWrite can operate continuously for 8 hours, and with Sleep or Standby the rechargeable battery can last for several weeks. After 20 minutes of non-use, RoWrite will automatically enter Sleep or Standby mode. To wake it up simply press the On/Off button and the led light should turn blue. When you start writing make sure the blue led light turns green as you touch the RoWrite pen to the notepad. When you pause to write a new word or a new line and remove the pen from the paper the led light quickly turns blue. This means your previous pen stroke was captured. If you do not see the light turn blue to green double check to make sure RoWrite is out of Sleep or Standby mode. If you still do not see a green led light, try turning your RoWrite off and on. If the green light does not appear it could mean your Pen’s AAAA battery needs replacing. When you want to start on a new page clickthe B button at the top left of RoWrite, this tells RoWrite you are starting anew page. When connected to a device with the RoWrite app you can create a new page from the app. 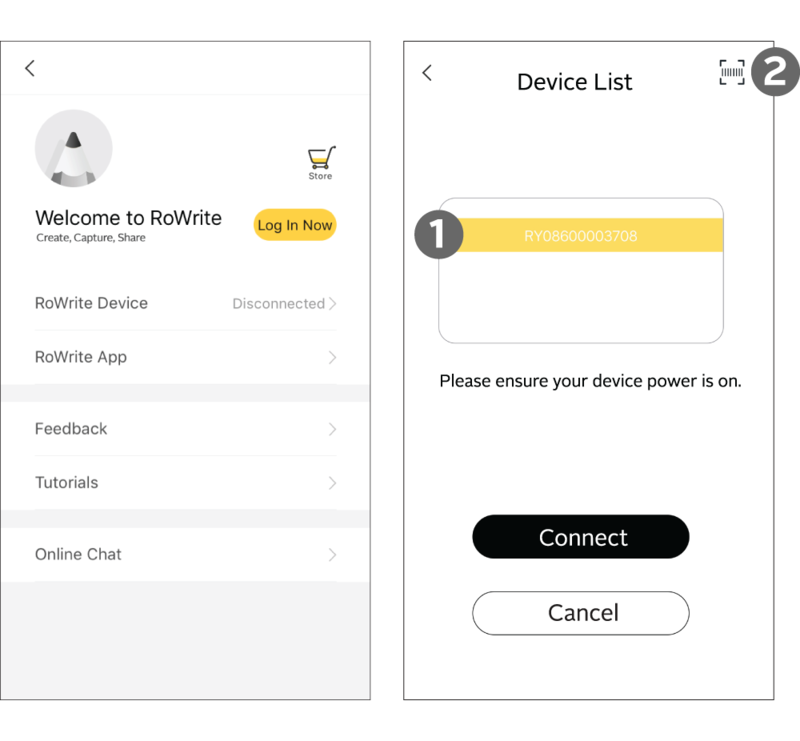 Pressing button A, when paired with a device with the RoWrite app, will send all your Pages saved on RoWrites’s internal memory to the device. The blue led will turn green and flicker rapidly. All Pages will be deleted from RoWrite’s internal memory once transmission is complete. Alternatively, when you first open the RoWrite app. The app will let you know if there are pages on RoWrite’s internal memory not transferred to the app. To transfer all the Pages you simply press “Sync Now”. Download the RoWrite app onto your mobile device by using the Google Play Store or Apple App Store. Once downloaded and opened you should create your account – simply follow the instructions to input your email and create a password. Make sure your RoWrite is turned on and the mobile device’s Bluetooth® is on. On RoWrite app's main screen touch the gear icon in the upper left. Touch "RoWrite Device" and read below to see two ways to pair your RoWrite to your mobile device. 1st Method of Pairing: If your RY# highlighted on the Device List Screen then press"Connect". If you see more than one RY # or you simply want to make sure of your RY # it can found on the back of your RoWrite device. 2nd Method of Pairing: If you do not see a RY#, and both devices are on, and the mobile device’s Bluetooth is on, then press the bar code icon in the upper right of the Pair Device Screen. Remove your Rowrite from the folio and turn it over. Position the bar code in the rectangle to pair device. RoWrite only needs to be paired once. Each time after opening the app, it should automatically connect.